I have read very carefully all that you say in your letter of April 2nd, and sincerely thank you for it. You may be sure that I shall bear in mind your interest in Mr. WIlliams. 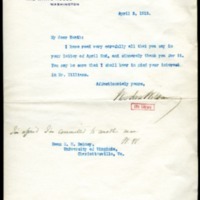 Wilson, Woodrow, 1856-1924, “Woodrow Wilson to Richard Heath Dabney,” 1913 April 3, WWP20486, University of Virginia Woodrow Wilson Letters, Woodrow Wilson Presidential Library & Museum, Staunton, Virginia.